With all the stories about nukes in the news, this report hopefully will inform you not only about the global danger that we presently face but also how an H-bomb works. We now know conclusively that North Korea has the capability to launch a 100 kiloton h-bomb and presumably target targets both in the region and the continental United States. Not only that but there is worry that a nuclear device capable of causing a lethal blow to the electric grid and electronics (see EMP Weapons) from an orbiting satellite that it launched earlier. Elsewhere in the world, it is believed that Saudi Arabia also has secured nukes from their ally Pakistan. Is it possible that many other rogue nations have secretly obtained enough uranium or plutonium to make an h-bomb or, at the least, a "dirty" radioactive bomb? Yes. The following reports show clearly that both uranium and plutonium are and have been on the black market for more than a decade. Some of the radioactive material is said to have come from misappropriations of fuel products following the dissolution of the Soviet Union. But, as you will see, there's enough blame to go around -- and enough radioactive material to make a many secret nukes in the very near future. Georgia's security service said on Monday it had detained six Georgian and Armenian citizens who were trying to sell $200 million worth of uranium-238. It was not clear whether the group had a buyer for the uranium or where the group had acquired it, Reuters said. "The members of the group were planning to sell the nuclear material, uranium-238, for $200 million when they were detained," said security service investigator Savle Motiashvili. A prefabricated container meant for transporting the uranium-238 was reportedly found at the apartment of one of the detainees. A Tbilisi city court sentenced members of the group to pre-trial detention. KIEV, Ukraine -- Ukraine's security service says it has arrested a regional lawmaker and two companions for trying to sell radioactive plutonium for $10 million. A ring of weapons-grade electrorefined plutonium-239 [right], with 99.96% purity. 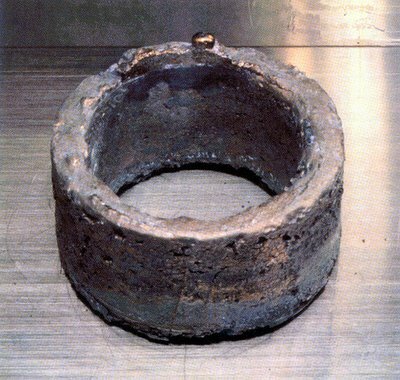 This 5.3 kg ring is enough plutonium for use in an efficient nuclear weapon. The service says the legislator and two businessmen from the western Ternopyl region were detained last week in possession of a suspected 3.7 kilograms (8.2 pounds) of plutonium-239, which can be used to make a so-called dirty bomb. Such a bomb spreads radioactive material over a wide area. The service said in a statement Tuesday it believes the material was produced in Russia during the Soviet era and smuggled into Ukraine through a neighboring country. Ukraine renounced nuclear weapons after the Soviet Union's collapse. If you look in a physics book, you will be told that you need 10 kilograms (22 pounds) of weapon grade plutonium-239 to make a supercritical mass (nuclear explosion). For Uranium-235 it's even more -- about 33 pounds. But there's a lot of information about nuclear material that gets left out of the books. I hope to share some of this with you in this article even though I know it will scare you. The truth is that by using something called a neutron reflector, the radiation coming from both plutonium and uranium can be sent back in to the radioactive material, greatly reducing the amount needed to form a critical mass by a little more than a half. What's even more horrific to learn is that this small amount of fissionable material can either be used in a low yield "atomic bomb" -- like the one's we dropped on Japan in WWII -- or they can be used as a detonator in a fusion hydrogen bomb. Atom Bomb or H-Bomb... What's the difference? An atomic bomb takes advantage of something called critical mass. This is the amount of radioactive material that, when brought together, will cause the material to suddenly explode. Uranium and plutonium are unstable, or radioactive. This means that they are always shedding neutrons, a particle in their atomic nucleus, at a slow but steady pace. These neutrons usually fly off harmlessly into space at the speed of light but can be harmful if they strike a living organism. Their energy can burn cells and cause damage and mutations to DNA. When enough uranium or plutonium atoms are brought close together, their neutrons bump into other radioactive atoms and cause them to instantly shed more neutrons. So the pace of shedding neutrons can speed up. If a certain number of radioactive atoms are in close proximity to each other this shedding of neutrons can multiply exponentially. This is called a "chain reaction." Allowed to continue the radioactive material will explode. The amount of material needed to do this is known as the "critical mass." For natural weapons grade (99% pure) uranium this critical mass is about 33 pounds or a chunck the size of a soccer ball. Plutonium requires about 11 pounds to achieve critical mass. 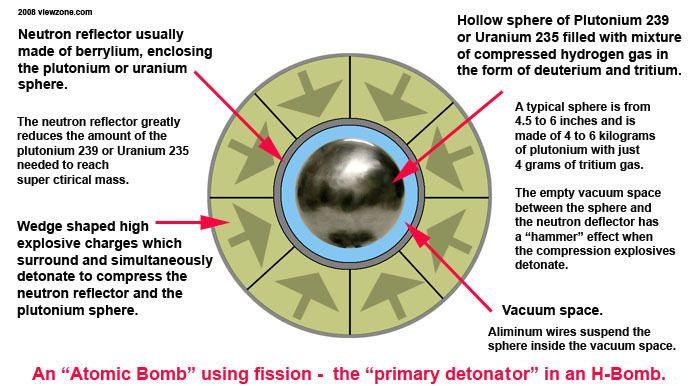 The typical fission bomb is designed so that the critical mass of uranium is separated into several smaller pieces, then suddenly brought together for detonation. The principle is simple and effective. The preferred technique forms the uranium or plutnium in the shape of a hollow sphere, so that the empty space in the center effectively separates the nuclear material and keeps it sub-critical. Explosive charges surround the sphere and, upon detonation, instantly implode and compress the material so that it reaches critical mass in the center of the sphere and explodes. Scientists soon discovered that materials like Baryllium can reflect the neutrons, like a mirror reflects light. They found that if they enclosed the sphere of uranium or plutonium in a neutron reflective sphere upon detonation the amount of fissible material needed was significantly less. Neutrons that would usually fly off into space were directed back into the material, where they acted like additional mass. 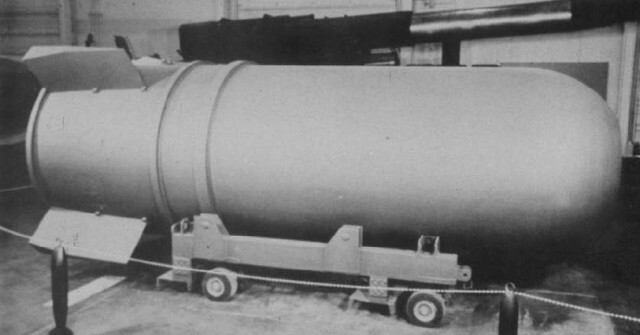 After WWII, weapon production soon moved from Uranium to the lighter Plutonium, but the total weight needed for fission bombs dramatically limited their explosive size. The explosive effect is directly related to the amount of fissible material and even with the use of neutron reflectors the nuclear weapons were extremely heavy. The next big improvement in nuclear bombs was the hydrogen bomb. Here the main source of the explosive reaction is not fission -- the breaking down of radioactive atoms and the release of energy -- but fusion, where atoms are forced together to form new elements with the release of even greater energy. The main reaction in a hydrogen bomb is, of course, hydrogen. This is the lightest atom -- number 1 on the periodic table of elements. It has one electron orbiting its nucleus but the nucleus can exist with either one proton, a proton and a neutron, or a proton and two neutrons. The last two configurations are not usually found in nature and are the result of something either natural or artificial adding neutrons to the nucleus. Hydrogen with a proton and neutron, call deuterium is created in the atmosphere from bombardment by cosmic radiation and is found in relative abundance in the ocean. Hydrogen with a proton and two neutrons in the nucleus is called tritium and is rarely found in nature. Tritium has a short life and degrades back to regular hydrogen in nature. To obtain a supply of tritium, scientists had to be very clever. The exlosive power of a hydrogen bomb comes from the interaction -- fusion -- of a deuterium and tritium atom. The fusion reaction results in the formation of a Helium atom (number 2 on the periodic table) plus a free neutron and, here's the important part, the release of an amazing 17.6 MeV of energy! The nuclei of tritium and deuterium both have a positive charge and naturally repel eachother. Enormous pressure and energy must be used to compress them and allow the "strong nuclear force" to take over. This is achieved by detonating a small fission atomic bomb in the confined space of the bomb casing and designing special reflecting surfaces to focus the intense x-rays and neutrons from this primary explosion to the secondary cylinder where the hydrogen will fuse. One of the main problems with the H-bomb was obtaining the tritium. Scientists found that they could generate this on-the-spot with a compound combining lithium (number 3 on the periodic table of elements) and deuterium, obtained from heavy water used to cool a reactor. The result was a dry, solid powder called Lithium-deuteride. When a neutron (from the primary explosion) combines with a lithium atom, the result is a helium atom and a tritium atom. The tritium quickly finds and fuses with the deuteritium atom to fuse into a Helium atom and shoots a free neutron to start the reaction all over again. The fusion reaction causes the plutonium rod and the uranium cylinder case to contribute additional neutrons from fission and the resulting explosion is many magnitudes greater than an atomic bomb. A:The stable bomb. B:The explosive charges surrounding the plutonium sphere detonate and compress against the barrylium reflector. C: The reflector compressed the plutonium sphere to critical mass where it ignites the tritium gas and causes a fission explosion. X-rays and heat cause the styrofoam to turn to plasma and reflect off the baryllium lined walls and focus on the secondary cylinder. 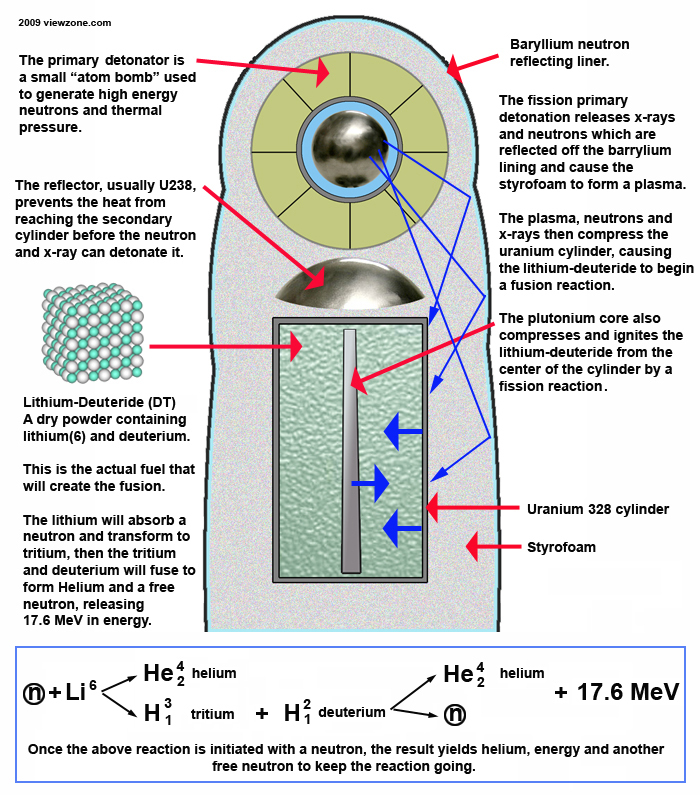 D: The plasma and explosion compress the secondary cylinder causing the lithium-deuteride to react, releasing tritium and resulting in a fusion reaction. E: The uranium casing and plutonium rod contribute to the flux reaction and a fireball explodes. The worlds most powerful hydrogen bomb was detonated on the 30th of October 1961. The bomb had an explosive force of 58 megatons, or almost 6,000 times more powerful than the Hiroshima bomb. The bomb was dropped by an aircraft, and detonated 365 metres (1,200 feet) above the surface. The shock wave produced by this bomb was so powerful, it went thrice around the earth. The mushroom cloud extended almost 60 kilometres into the atmosphere. Resulting downfall was measured over the entire northern hemisphere. A flash of light could be observed all the way to Hopen in the Norwegian Sea, Sor-Varanger in the Norwegian county of Finnmark and by the Inari Lake in Finnish Lappland. The main purpose of this article is to make you aware that a hydrogen bomb is just a very small, low yield atom bomb which has been combined with a non-radioactive compound that is readily available and plentiful. The compound is made from lithium -- the same element used in your laptop and cellphone batteries -- and hydrogen -- plentiful in the earth's oceans. Manufactured correctly, even a small amount of either plutonium or uranium is capable of detonating a hydrogen bomb which could vaporize everything for a 30 mile radius in less then a second. So much of what we are told through tne media assumes that the radioactive material acquired by rogue nations or terrorists will be used in a fission bomb or a so-called "dirty bomb". The yields and limited areas of destruction are vastly out dated. While the public's understanding of nuclear technology has been frozen in the post WWII era, huge advances have been made under the veil of secrecy. Neutron reflectors and sophisicated detonation methods have increased the efficiency of even the most basic fission bomb while the discovery of lithium-deuteride has unfortunately made quantum leaps in the potential explosive destruction of fusion bombs. It's a new world -- a dangerous one. 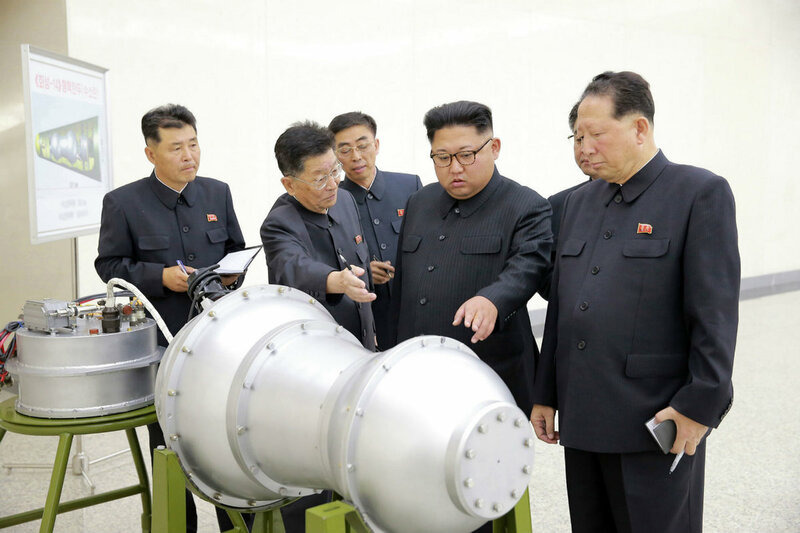 North Korea is believed to have refined both enriched uranium and plutonium. They process these elements within their country at nuclear plants and do not need to import them. Hypothetically, North Korea could produce around 20 kilograms of 90 percent weapons grade uranium per year. In a recent underground test they have achieved a hydrogen explosion with approximately 100 kilotons yield. That's roughly ten times the bomb yield of the Hiroshima explosion, as suggested by monitoring the surrounding seismic readings of 6.3. In fact, previous underground tests often were used to test small implosion devices such as would be used for a primary detonator for a much larger H-bomb (and for an EMP device orbiting in a satellite). The technology for the inert uranium-328 cylinder, filled with lithium-deuteride, is so simple that it needs no test. Simple electronic instruments can determine if the x-rays, neutrons and thermal pressure are adequate to activate a fusion reaction in a large scale H-bomb. Iran is already enriching uranium and may have accumulated enough uranium for a primary trigger already. The technology for converting this uranium to an H-bomb is dangerously simple. 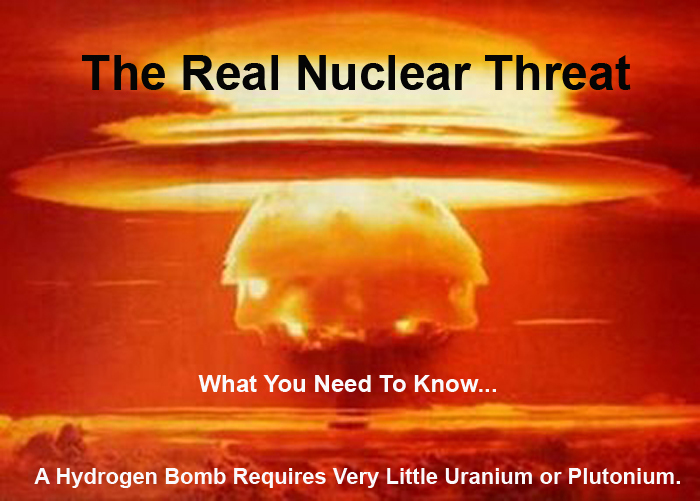 The media and politicians warn us of rogue nations being years away from making a bomb and speak of tens of kilotons of fissionable material needed for even a low yield or ""dirty" bomb, but the truth is much more terrible. This technology is easily within reach of any nation seeking to use its apocalyptic power. The physics is well understood and the amount of fissible material for the primary detonation is within reach. It is likely that several pounds of plutonium or uranium has already been secured and an H-bomb has been assembled. Missing Uranium & Plutonium -- whose got it? Sweden missing 100 kilograms of enriched uranium - The Swedish nuclear energy monitoring agency is currently disputing claims by the CIA that 100 kilograms of uranium have disappeared. Sweden's nuclear inspection agency (SKI) has repeatedly recorded significant discrepencies between the wmount of waste received for recycling by the Swedish company Ranstad Minerals. The uranium has yet to be accounted for but is believed to have ended up in Syria. CIA officials told a Swedish newspaper, "The company (Ranstad Mineral) is a security risk and we have taken the matter to top levels to get the Swedes to stop them... If it transpires that radioactive or nuclear material has been sent on from Sweden to Syria then this is a very serious matter for Sweden." China missing 8 kilograms of U-235 -- Eight kilograms or 17 pounds of uranium has gone missing in China, delaying the verdict in a trial of four men charged with attempting to sell it on the black market, state media said. A court in Gaungzhou, capital of China's southern province of Guangdong, heard the four tried to sell the material between 2005 anf January 2007. The men were arrested after a potential buyer in Hong Kong turned them in to the authorities. However, despite having the men in custody, they were unable or unwilling to locate the uranium. More than 20 people had fallen ill after being exposed to the enriched uranium (235) but the material remains missing. Scotland loses 10.2 kilograms of uranium (235) -- Vice President of the European Commission, Frans Andriessen, said the uranium "disappeared" from the nuclear fuel reprocessing plant in Dounreay, Scotland. Authorities are still trying to locate the material which could be used to make a nuclear bomb. Republic of Congo missing 100 "bars" of uranium -- Arrests were made in Kenshasa, Congo, in response to the reports of the disappearance of "more than 100 bars" of uranium from the Regional Center for Nuclear Studies in Kenshasa. Arrested were the director, Fortunat Lumu, and an aide who have so far not shed light on the whereabouts of the missing uranium. Virginia (US) site missing 55 kilograms of uranium -- A reprocessing plant, BWXT, located in Mt. Athos, Virginia, reported an inventory "accounting problem" upon receipt of uranium shipped from a plant in Kazakstan. The shortfall appears to be about 55 kilograms of uranium "on the order of plus or minus 100 percent" pure. During repackaging in Kazakhstan, data was compiled on the mass of uranium in each can. The U-235 enrichment level was also determined, with two separate tests for each can. After BWXT received the material, it verified the tamper-safe seals and identified the weight and contents of the containers before securing them in a vault. NRC records show the uranium/beryllium scrap was removed from sealed containers, tested for dissolution rate, baked and returned to containers in tamper-proof seals. But one problem was noted. "During the same period, a security vulnerability existed relative to searches of personnel exiting the processing area under emergency conditions," said the memo. Los Alamos missing enough plutonium for 150 nuclear boombs -- The beleaguered Los Alamos National Laboratory (LANL) is unable to account for 765 kilograms of plutonium according to a statement from the nuclear watchdog froup to director G. Peter Nanos. According to the statement, "The Department of Energy (DOE) reported a discharge to waste from LANL of 610 kilograms of plutonium; Los Alamos indicates a figure of 1,375 kilograms, the equivalent of 150 nuclear weapons. This is unacceptable by any imaginable standards and constitutes a crucial safety, environmental, and security issue." Japan loses 206 kilograms of plutonium -- Japan announced that 206 kilograms of its plutonium stockpiule -- enough to make about 25 nuclear bombs -- is missing. Government scientists said that 6,890 kilograms of plutonium had been extracted since 1977 from spent nuclear fuel at a processing plant about 120 kilometers north east of Tokyo. But that is 3 percent short of the amount the plant was estimated to have produced. Experts say the missing amount is disturbingly large and rumors have linkrd the missing plutonium to North Korea. Britain missing 19.1 kilograms of highly enriched plutonium -- Enough plutonium to make five nuclear bombs has gone missing from Sellafield in Cumbria in the past 12 months. The official report lists the "materials unaccounted for" seem to have disappeared from a reprocessing plant. No further details are available. Somewhere, someone has the material for a nuclear trigger. The other components, specifically the lithium-deuteride, are relatively easy to secure. We now just wait and see if some nation or group is crazy enough to use it. Since the fusion reaction produces mostly neutrons and very little that is radioactive, the concept of a 'clean' bomb has resulted: one having a small atomic trigger, a less fissionable tamper, and therefore less radioactive fallout . Carrying this progression further would result in the suggested neutron bomb, which would have a minimum trigger and a nonfissionable tamper; there would be blast effects and a hail of lethal neutrons but almost no radioactive fallout; this theoretically would cause minimal physical damage to buildings and equipment but kill most living things. The theorized cobalt bomb is, on the contrary, a radioactively "dirty bomb" having a cobalt tamper. Instead of generating additional explosive force from fission of the uranium, the cobalt is transmuted into cobalt-60, which has a half-life of 5.26 years and produces energetic and highly lethal (and thus penetrating) gamma rays. The half-life of Co-60 is just long enough so that airborne particles will settle and coat the earth's surface before significant decay has occurred, thus making it impractical to hide in shelters. This prompted physicist Leo Szilard to call it a "doomsday device" since it was capable of wiping out life on earth. Such a device might be made and used as the ultimate threat in a political stand-off, effectively saying to the world, "Do as we say or we all die!" So if I understand the science behind the "doomsday bomb" then all Kim in North Korea has to do is to build a really big h-bomb with a cobalt casing -- and just let it sit there in his country. Then threaten to detonate it, which will kill everyone on earth, unless his demands are met! And no one would dare attempt to wipe it out because it might go off! Check-mate!